Shree Seti Devi Primary School is situated on a hill above the village of Shivalaya and educates children from playgroup to Grade 6. NAFA has been involved with the Shyama school since 2011 when they funded the building of three toilets and the renovation of 4 classrooms. They also assisted the school by providing funds for the school committee to lay pipes to bring water to the school. This played a vital role in the school, the teachers commented that after the installation of the water infrastructure they noticed a reduction in absenteeism and the health of the children had improved. 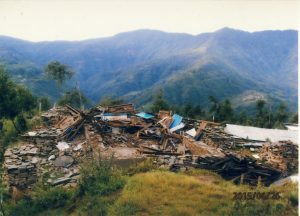 The epicentre of the second earthquake in May 2015 was in the Dolakha area, this destroyed the classrooms, office and toilets. NAFA committed to assist the school by rebuilding 5 classrooms – the headmaster Ngawa Sherpa assured NAFA he would find the funding for the other two classrooms and the toilets. Sabin Shrestha, the architect, accompanied Ross and Brenda Hazelwood to visit the school in late 2015. 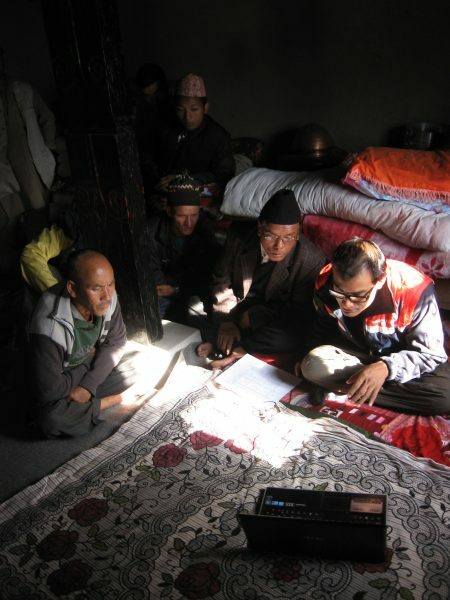 Sabin had been engaged to draw up the earthquake resistant classroom plans for all the NAFA supported schools. Sabin felt the visit was worthwhile as this gave him a better understanding of the remoteness and conditions of these isolated schools. He was able to take this into account when drawing up the plans. The school principal and the local builders were very interested in seeing his vision for the new classrooms and how they would be constructed. 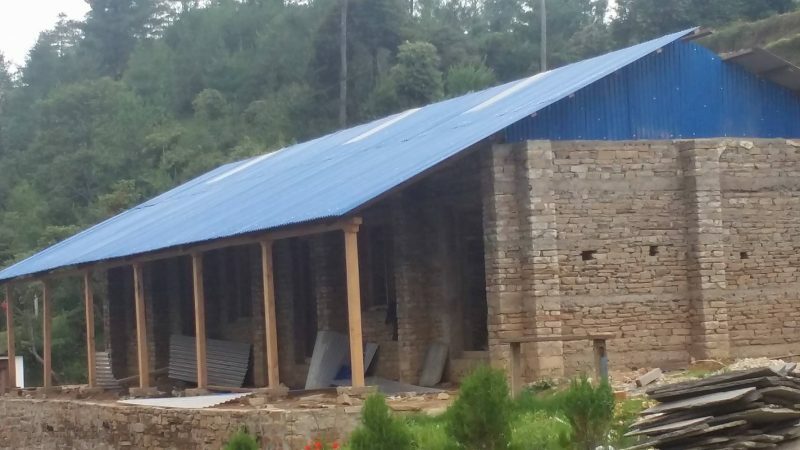 Once the plans were approved by the Nepalese government in October 2016, four builders from each of the four schools in the eastern districts attended a 7 day earthquake resistant building workshop. NAFA engaged two engineers and a stonemason to conduct the training to skill up the local builders in the new building techniques. The builders, with their newly acquired skills began preparing the foundations in December 2016. 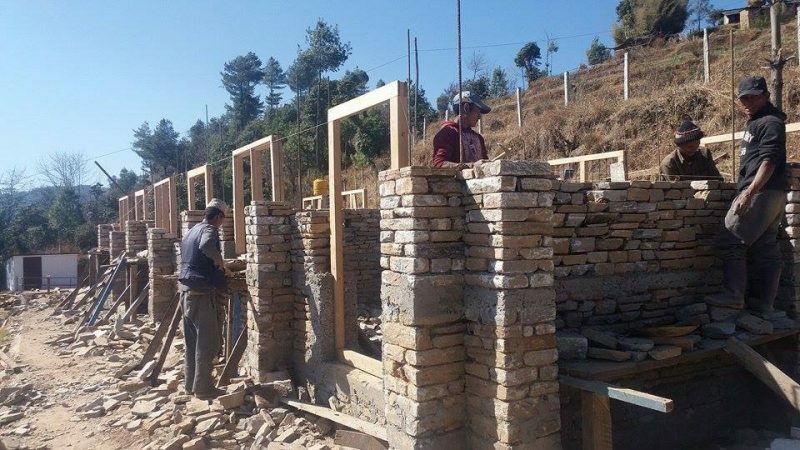 To ensure the construction met the new guidelines, NAFA hired a local engineer, Surendra Budhatoki to oversee the construction of the classrooms in three villages. He was on hand to assist in the laying of the foundations, through the various stages of construction and finally when the roof truss was being installed. The engineer provided regular reports on the progress of the construction. The school principal was very pleased with the different stages the rebuilding of the school and kept NAFA up to date with photos of the different stages of construction. The first 3 classrooms were completed in August 2017. 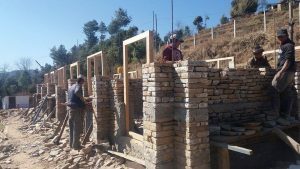 At the start of construction in January 2017 the tenacious builders were faced with very cold weather and snow conditions and then towards the end of the construction they worked through the hot and wet monsoon. The second stage of construction of the last 2 classrooms began in September 2017 and is expected to be completed in December. NAFA would like to thank the Nepalese Association of Queensland (NAQ) for their donation of $18,000 towards the construction of these classrooms.